Make-Up mishaps are common when you can’t see what you’re doing. For this reason, it’s a great idea to try to find a comfortable yet functional makeup mirror that is going to have all the bells and whistles that will complement your lifestyle. You’ll come to see that there are a bunch of types and styles out there. Each have their benefit, but what is going to work for one person, isn’t going to work for another. So, if a vanity mirror isn’t right for you, don’t get discouraged. We have made it easy for you to do your homework first, so that you can find the right mirror for your needs. First, let’s take a look reviews of the best lighted makeup mirrors out there. Read on to find out what they offer and view the pros and cons to get an idea of standard options and customer concerns. The Conair oval double-sided lighted mirror is a simple and easy to use bathroom mirror. Designed to complement any modern bathroom, it stands at a total of 18 inches tall and features a sturdy 2-inch swivel base with a modern yet aesthetically pleasing form. The face is oval and offers options with both a normal mirror on one side and a 7 times magnification mirror on the other. Each side includes inset lights that allow for soft natural lighting. If you are seeking something that gives a lot of light, this may not be the best choice. While the lighting mimics outdoor lighting, it doesn’t put off a lot of light and can be considered dim for some. This Conair lighted mirror is attached to a 5-foot power cord with the on/off switch located 6 inches from the base. 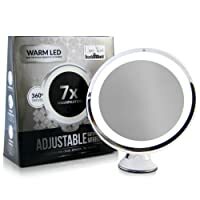 The Warm Led Lighted Makeup Mirror Vanity is a modest product, standing only 7 inches tall with a simple circular design. Made of durable plastic with bright inset LED lights that surround the efficient 7x magnification mirror, it is a functional choice for everyday use. The lights are bright, providing stark light so that you can see all of the fine details. It is ideal for makeup and tweezing. This bathroom mirror has an innovative suction cup base the is easy to set-up so that it will not move around. You can stick it and then leave it where it stands for hours of hands free use. When you are finished, it collapses into an easy to store 7-inch profile. Additionally, it offers a convenient cordless design, using 3 AA batteries instead of a power cord. The Simplehuman Sensor Mirror is a weighted standing mirror that stands upright for convenient hands-free use. It has an adjustable stand that extends from 15 – 18 inches in height, making it easier for you to adjust it to see you rather than the other way around. Additionally, it pivots both up and down as well as side to side 180 degrees. The mirror itself is a large 9 inches in diameter that is surrounded by a patented Tru-Lux design light system. The Tru-Lux lighting system uses laser sensors to detect when you are near the mirror and automatically light up the inset LEDs as you approach. The inset LEDs are powered by a USB rechargeable battery with included power chord and adapter. You should be able to use this bathroom mirror on a regular basis for up to 5 weeks. Note: if you use this item more often or if you place the mirror in a place where it will get a lot of walking traffic, the sensor will recognize you when you are walking by. For longer life, it is suggested to turn the mirror off or keep it out of high traffic areas so that the sensor isn’t repeatedly turning it on. Small footprint, doesn’t take up a lot of counter space. The Conair Natural Daytime Lighted Round Mirror is a reliable mirror for regular use. With a modern yet simple design, it will fit into most any bathroom design and will look nice sitting on a counter when not in use. It stands at approximately 15.8 inches tall, with a 7 inch brushed nickel finish weighted base holding up an 8.5 inch round mirror. The face is double sided with natural 1X magnification on one side and then 10X magnification on the other with just enough space to see your full face clearly. Both sides are pristine glass mirrors of high quality with no distortion to the view. Switch between magnifications by turning it around. The face rotates 360 degrees on a swivel hinge. It includes replaceable inset fluorescent lights that are powered by a connected cord. They provide decent natural light, making this an ideal choice for makeup and grooming every day. The Floxite Daylight Cosmetic Mirror is less of a daily use mirror and more of something that you want to have on hand if you need up close details. The face is is 7.5 inches in diameter and is single sided with 10x magnification distortion free surface. With only one side, this is truly a single magnification mirror, so there is no normal view or setting. This bathroom mirror is 13 ½ inches tall with a slightly adjustable weighted plastic base. This makes it ideal as a countertop mirror that would complement a standard bathroom variety. You can do your makeup in front of the sink and then check on closer details, blemishes or hard to see spots on your face with the additional magnification that this model provides. 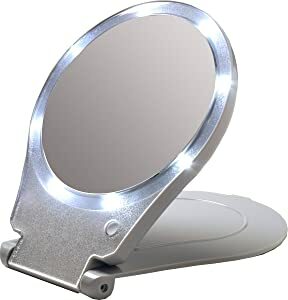 Around the outside of the mirror itself there is a round T5 light source that provides a bright glow so that you can really see what you are doing. The bulb is replaceable and the entire unit remains cool to the touch, even after being on for a while. When it comes to cosmetic vanity mirrors, there are a dizzying array of options out there on the market. Everyone wants something different and it can be difficult to make the right decision. You want to make sure that when you spend the money on an item like this, that you are going to get use out of it for years to come. To do this, it’s best to get to know the product so that you can anticipate your needs, thereby making the correct informed decision. So, let’s get started and figure out which style of makeup mirror is the right choice for you. Where are you going to put your mirror? They say location is the most important thing when buying, and that goes for your makeup mirror as well. Some of us like to paint our faces in the bathroom while others have a vanity. Some, always on the go, will want something that is easy to bring along. The point is, finding one that is going to work with you comes down to where are you going to use it most? Countertop models are those that come with a base or stand, that can easily fit on a counter. They are ideal for bathroom and vanity settings. Choose between suction cup bottoms or weighted stands if you want something that you can use hands free without fear of dropping. Other countertop mirrors will come with a removable face plate that allows you to set it up when not in use but bring it up close by simply removing it. Countertop bases usually range in 5 to 15 inches in height and you can find some that offer the flexibility of adjustability if that is a concern for you. These can come in single sided normal mirrors, single magnification or multiple magnification options with a reflection on both sides. Handheld makeup mirrors are those that have a handle and that are designed to be held up to your face. This type is a bathroom essential for men and women because they come in a variety of sizes that are both simple to use and generally quite portable. These can come in small compact style mirrors or large face mirrors. 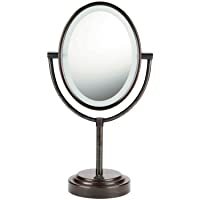 The best makeup mirror in this category will be one that you are comfortable holding and that has little distortion when you attempt to see your whole face in it. For complete makeup application, consider getting a style that has both normal and then an additional magnification. Designed specifically for those that need to take their grooming on the go, travel makeup mirrors are an excellent option if you have to pack. More than a general handheld variety, these usually have added protection and offer everything you need when you are away from home. You will find that these come from the most basic compact varieties to complex that include accessories, lighting and multiple magnification from normal to 20X amplification. Additionally, these are often sturdy and made from shatter free glass. Shower mirrors are just what they sound like, they are designed to be taken into the shower with you and often include some form of fog resistance so that you can still see your face even when surrounded by hot steam. You might not think of these as makeup mirrors, but they are good to note because they can be the best choice for tweezing. Tweezing is easiest when pores are wide and willing to give when you pull on the hair. Where better to do this than the shower? Choose from two main kinds of fogless shower mirrors. One style includes a coating that is applied to the glass that resists water, causing it to bead up rather than to fog. Another kind allows you to pour hot water into the back of the mirror, heating it up and working sort of like the defrost option on a car. As the water heats it up, it repels the steam and gives you a clear view. Fogless shower mirror options also come with a number of accessories that can add to your in shower grooming experience. Magnification is usually a must have for makeup mirrors because amplification of the image allows you to see the fine details that you may otherwise miss. They are nice to have when you need to do additional touch ups or to add creative touches to your look. All styles of mirrors offer some form of magnification but the most common ranges that you will see is from zero to 20. At zero magnification, this is the same as any other mirror that you would look at. At 20 you can see just about everything. A nice general middle ground is choosing something between 5 and 7. Magnification can also help if you have vision problems or if you wear glasses. When trying out start with a 10X magnification mirror and see how it works for you. Make sure to remove glasses before and then adjust to what feels comfortable for you. If where you normally apply your makeup has ample brightness, then lights may not be much of a concern for you. However, many people lack natural light in their bathroom or require additional help so that they can put on their makeup in a way that looks good throughout the day. Too dim you will tend to put on shades that are too light for you, too bright and you may find that shadows are a problem. The solution is to find a makeup mirror with lights that provides you with ample wattage to see what you are doing, but a natural glow that reflects the kinds of brightness that you are going to be in when you are wearing your makeup. Because of this, an ideal choice is a lighted makeup mirror that also includes a dimming option. Often, these are a bit more expensive and harder to find. However, it is well worth it! Additionally, one of the biggest complaints is that there is either not enough light or too much light. Finding a balance for all is easier as well with a dimming switch or multiple lighting options. Aside from dimming, another consideration for lighting is the kind of bulb that is used. Since we can’t all be movie stars with alternating wattage bulbs that surround a large mirror, the next best thing is choosing quality and long lasting wattage that comes as part of your item. What you want in a makeup mirror with light is something that comes with an above average CRI (Color Rendering Index). The higher that it is on the scale will give you a more accurate result when putting on your makeup because it will reflect true colors of foundation, shadows and blushes when you are out in the daylight. Ideally, anything over 80 is good and as close that you can get to 100 is better. Other things to think about are lumens and wattage. Lumens around 525 and wattages around 75 to 100 are what you want to aim for. LED lights are super bright and offer enough wattage that you can usually see every detail. On the plus side, you don’t have to change the batteries often (or ever). On the bad side, they can sometimes be too harsh and are often more bright than what one would want for a natural look. 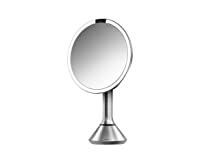 Some makeup mirrors include a standard bulb with wattage between 75 to 100. This is ideal and provides a good source of natural like lighting that glows rather than shines. It is preferable for this style to include multiple bulbs, which will ensure that you are receiving a glow from multiple light sources. The plus of these are that they give that lovely natural look. However, they tend to need to be replaced often and they are less durable than other bulb options. Sometimes there will be an explanation that there is light included but it isn’t clear to see what kind of bulb or wattage. This doesn’t make for a bad light, but it can make for an uninformed decision. When you see reviews about lighting for your makeup mirror that seems vague, be sure to check out reviews and see what people are saying about it. Chances are that the light is some form of LED or halogen that has a different casing to it.